So, this is the last time I’m writing about Jonah -- I promise. Maybe. It’s just that his story is so chock-full of things that smack me between my eyes. Last week I wrote about being inside the fish. This week, Jonah’s been spit out onto the shore, alive. He added, “It throws you back in the fray,” back in the game, back in the battle. • Sunday school from 10 to 10:45 a.m.; worship service at 10:45 a.m. and evening worship at 5:30 p.m. For more information, call 859-824-6470. • Pastor - Donald Joe Kannady. The church is located at 7770 Lawrenceville Road in Holbrook. For more information, call 859-391-5993. Catch the Christmas spirit when the hand pumped pipe organ rings out songs of the season along with harp, violin and flute. 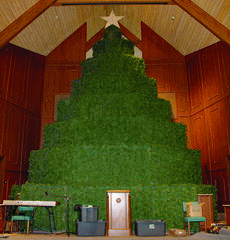 Williamstown Baptist Church’s singing Christmas Tree is back for another year.